Along with constituting a welcome comeback for the much derided M Night Shyamalan, 2015's The Visit introduced us to a pair of prodigious talents in the young Australian acting duo of Olivia De Jonge and Ed Oxenbould. 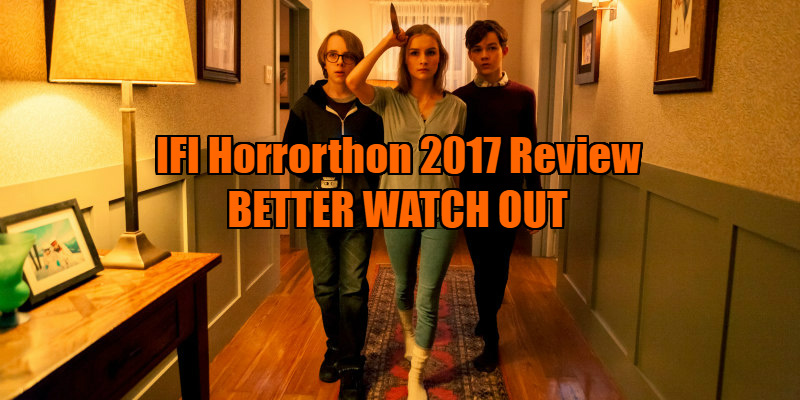 Director Chris Peckover was clearly impressed, as he's reunited De Jonge and Oxenbould for his Christmas set horror Better Watch Out. It's the festive season, and 12-year-old Luke (Levi Miller) is left in the care of babysitter Ashley (De Jonge) while his parents (Virginia Madsen and Patrick Warburton) head off for a night of merrymaking. As established in the opening foul-mouthed 'locker room talk' between Luke and his nerdish friend Garrett (Oxenbould), Luke is smitten with Ashley, and hopes to make a move on the older girl during the evening. Initially, Luke's delusional plans to win the heart of his babysitter are laughable at worst and adorable at best, but it soon becomes apparent his intentions are far more sinister than a simple misguided childhood crush. As the evening progresses, Ashley finds herself fighting for her life when the burgeoning sociopath in Luke comes to the fore. Sometimes a movie stumbles into accidental relevance. While in production on Better Watch Out, Peckover couldn't have predicted his film would hit cinemas in the midst of a global conversation around male entitlement, with movie moguls, politicians and media figures being exposed as serial abusers on an almost daily basis. Better Watch Out's antagonist may be a child, but he represents the worst of entitled white malehood. The movie plays like a lost prequel to Ferris Bueller's Day Off, about that time Ferris murdered a bunch of people simply because he figured his privilege and intelligence would allow him to get away with it. You won't see a more resonant movie in 2017. As Luke, Miller (another Aussie) is a revelation. Not only does he pull off the feat of making a 12-year-old boy a genuinely terrifying and intimidating presence, but he also makes his character so despicable that we find ourselves in the uncomfortable position of wishing for a child to suffer a painful death. So convincing is his performance that Miller's parents probably now keep their bedroom door locked at night. As the object of his unwanted attention, De Jonge is the embodiment of the final girl archetype, her will and moxie making up for a lack of physical strength. Peckover and co-writer Zack Kahn's script is tight and well paced, packing a lot of thrills into an economical 89 minutes. No threads are left hanging, with what seems like plot holes and inconsistencies all nicely wrapped up by the end. It pulls off the tough feat of switching tone from knockabout Christmas comedy to disturbing psychological horror with what seems like effortless ease, though credit must also go to its exceptional young Antipodean cast for their role in pulling this off so convincingly. At this point there are probably as many horror movies set during Christmas as there are seasonal comedies, but most opt for a comic tone. In truth, the Yuletide setting of Better Watch Out is little more than set decoration, but join the ranks of Ho-Ho-Horror it must regardless. A film that goes to some incredibly dark and daring places (the psychotic behaviour indulged in by its young villain may cross a line for some viewers, and the final words of one victim are particularly disturbing in reminding us of their tender age), Better Watch Out might be the blackest Xmas horror to date, and it's a more than welcome addition to a growing sub-genre. Better Watch Out is in UK/ROI cinemas December 8th.